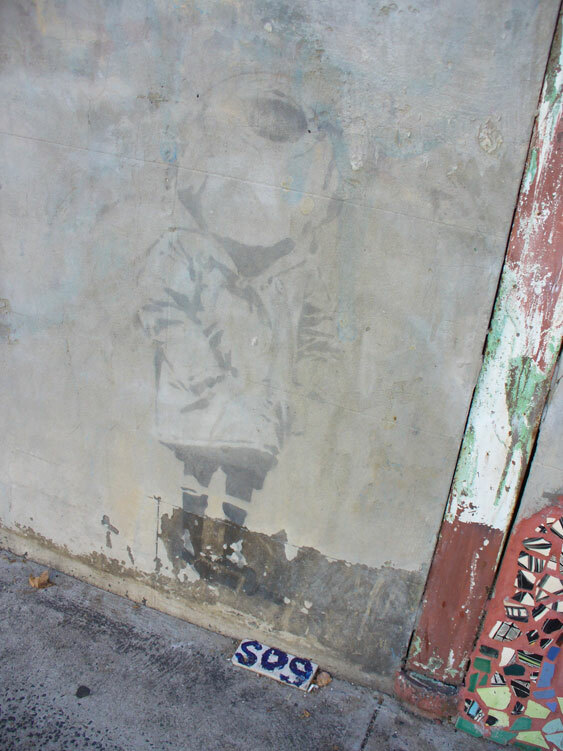 Eleven years ago I photographed a fading piece of Banksy graffiti in Newtown, an inner west suburb of Sydney. 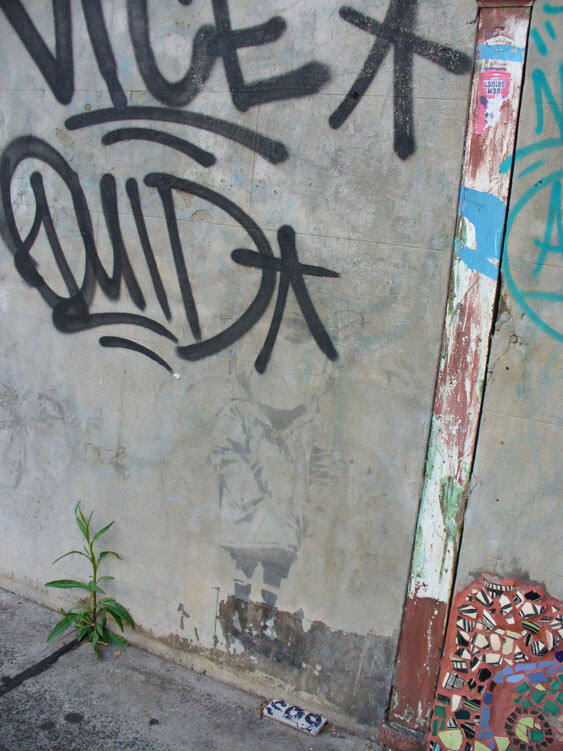 It’s a version of the UK artist’s ‘Diver’ stencil and would have been done in 2003 when he made a secretive visit to Sydney. 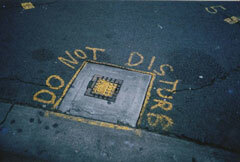 Back then I was concentrating on pavement graffiti and was not much interested in Banksy. I’m still not that interested, but anyone who writes about graffiti of any sort must eventually pay attention to the Banksy Phenomenon. By 2008 Banksy was notorious enough for me to decide that I should photograph the Diver. It helped that there were two other types of graffiti nearby – a tile with hand-painted lettering fixed to the pavement (of course) and a mosaic of broken china stuck to the wall. 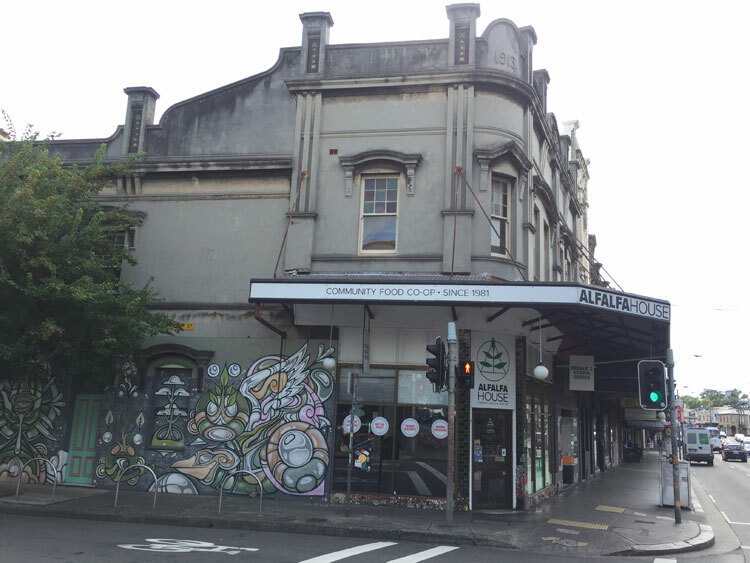 All of these were along the side of Alfalfa House, an organic food cooperative that had been set up in 1981 at the corner of Enmore Road and Philip Street. Only a few people knew about Banksy’s brief visit to Australia in 2003 and while the whereabouts of some of his stencils in Melbourne were known, I found it curious that so little attention had been paid to this one in a fairly busy street in Newtown, especially as one of his works on a wall in London had sold for some thousands of pounds early in 2008. But by the end of 2008 the Diver had finally received attention. The name ‘Vice Quid’ had been sprayed over it, whether out of ignorance or defiance I don’t know. It’s possible an article in the Sydney Morning Herald had stirred up interest in the work. Even though the reporter had acknowledged that “Graffiti artists keep the whereabouts [of Banksy’s Sydney works] secret because there are fears the rocketing price of Banksy’s work means they might be broken out of the walls on which they are painted”, nevertheless he had been quite specific about the location of the Diver. When I privately expressed some dismay I was firmly told by a close acquaintance that it’s what should be expected. “It’s only graffiti. Graffiti’s not meant to last”. Not even Banksy’s. And it’s true. As I said in an earlier blog post – ‘Overpainting: order vs chaos’ – when taggers and spray-can artists paint over each other’s work, sometimes this is a display of disrespect and an assertion of territory, sometimes it’s a political act, and sometimes it is simply a natural progression in the world of informal street art, where the art is necessarily ephemeral. 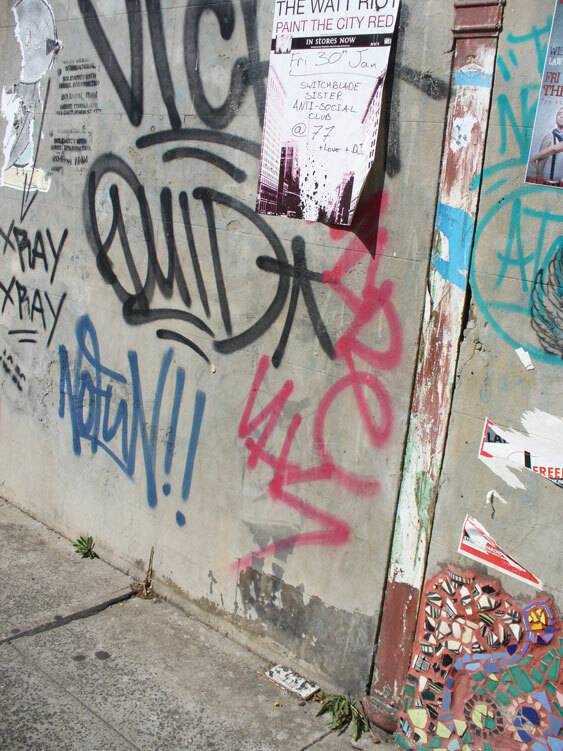 Within a few months the wall was covered with tags, stencils, paste-ups and notices. The Diver, which had remained untouched for five years, was now barely visible. A year later I couldn’t even be sure where the Banksy stencil was. In 2011 Alfalfa House must have decided a makeover was in order. 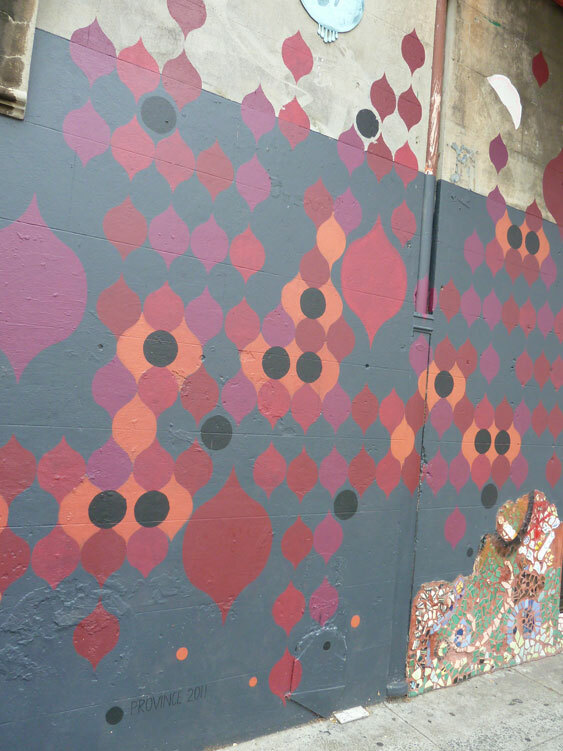 An artist was presumably organised to paint a mural on the side wall and it’s possible that someone, other than the artist themselves, thought this pattern was attractive. But, aesthetic qualities aside, in covering over what went before, the line had been crossed, from informal graffiti to commissioned art. Notice, however, that the old wall mosaic and the pavement tile had escaped unscathed. 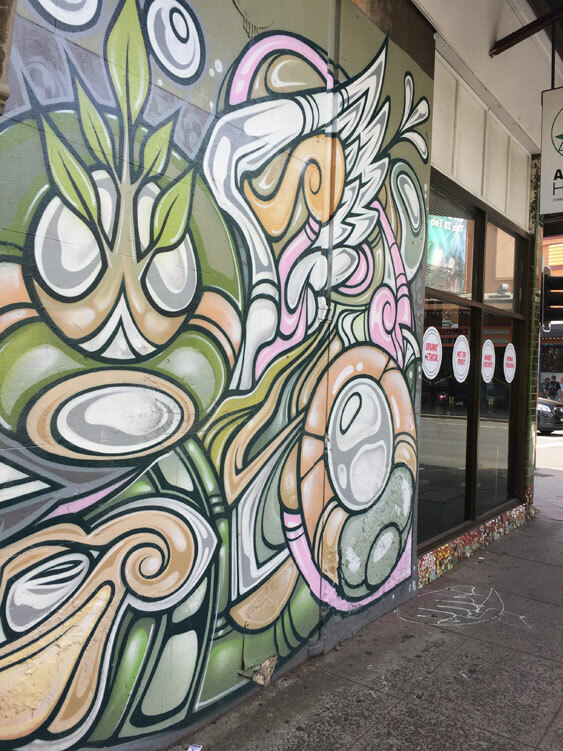 Fast forward to the present where the wall of Alfalfa House is now covered by a magnificent pastel-coloured work by well-known local street artist Phibs. A remnant of the mosaic remains but the rest has been painted over. The pavement tile is gone, its lowly place now taken by a horizontal tag on the concrete. But not even Phibs is above being scribbled on. So far the attempts at defacement have only been tentative. Banksy’s latest notorious stunt was the semi-self-destruction of one of his works seconds after it was sold at a London auction for more than one million pounds in October 2018. Originally titled ‘Girl with a Balloon’ the work was renamed ‘Love is in the Bin’ by Banksy. 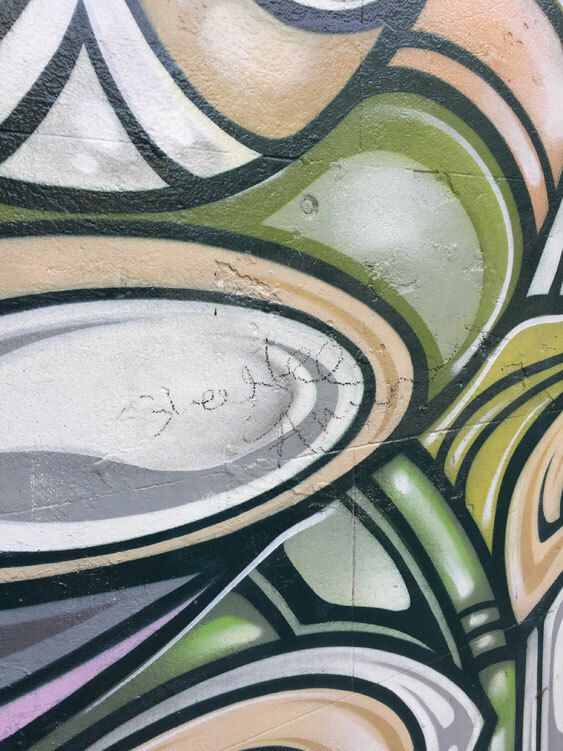 It does not take much imagination to see the metaphorical connection between the shredding of a graffiti-stencil-turned-framed-artwork and the ephemerality of art on the street. 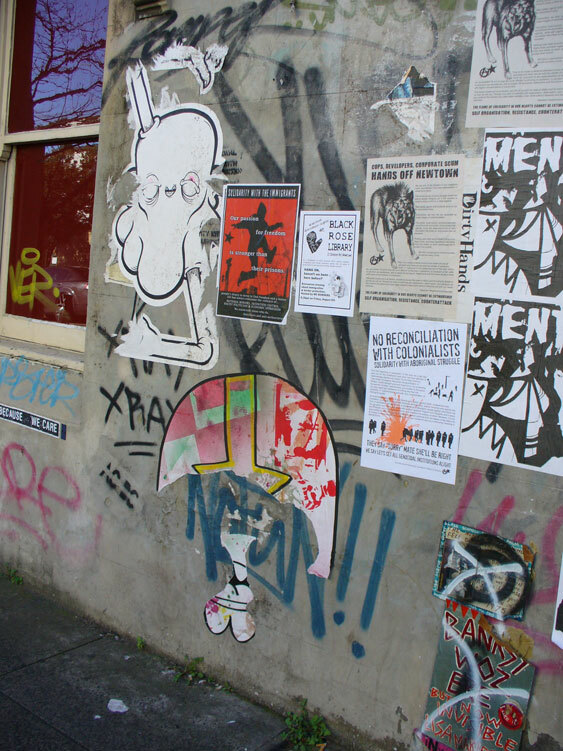 Jinman, Richard, ‘Details emerge of Banksy’s Sydney visit’, Sydney Morning Herald, 17 January 2008. ‘Banksy’s Girl with a Balloon artwork self destructs after selling for almost $1.9 million at auction’, ABC News, 6 October 2018.